Or "What I learned today." What I didn't learn, was how to resolve deadlocks. What I did learn via a crash course of forums, blog posts, BOL and tweets was how to start collecting the information that tomorrow should lead to resolution. This post will attempt to demonstrate the techniques I got to use today. I work in the financial services sector and we get files in from Pershing and every quarter it seems they make changes to those files. I'm sure in the mainframe world, files with different record types make sense but good grief, they are not exactly pleasant in my world. For these files, they are all a fixed length but based on some information in the first N characters of the file, it will determine how the rest of that line should be parsed. Our process has been implemented and running fine for a few years and a minor change (defined column lengths) by a coworker causes this SSIS package to start throwing deadlocks. What's curious though, is that the only thing active in that database is the SSIS package itself. None-the-less, it was consistently throwing "Transaction (Process ID N) was deadlocked on generic waitable object resources with another process and has been chosen as the deadlock victim." What was slightly odd was that the exact tables being blocked varied between runs. 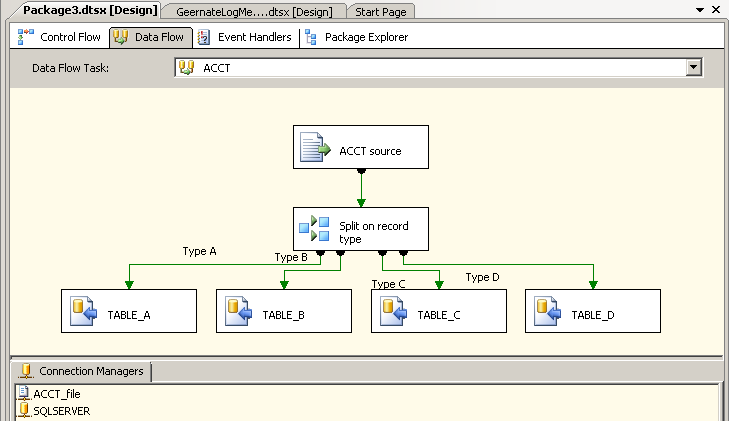 Below is a simplistic version of the SSIS package we used to load tables. There are record types A-V (with some letters missing in between) and the file itself is fairly small---750 characters wide and tens of thousands of rows in our file. There are no lookups or anything that talks to the database but the destination writers. They are the SQL Server Destination components and truth be told we've had more oddities with their behaviour (timeouts, unable to prepare component, etc) than the standard OLE DB component than I care to think about. The tables we dump the data into are also simple. They are all chars defined exactly as wide as they are in the corresponding Pershing standard file layout plus an identity column and an insert date. No triggers, no foreign key, nothing that you couldn't do in Access. Only index is the clustered primary key which is the identity column. As I script it out, I am surprised to see that they do have a default constraint applied to the Insert date. As a general rule, we don't do that here. It shouldn't have any bearing on the issue as we explicitly provide a value for the insert date for all the rows going in. 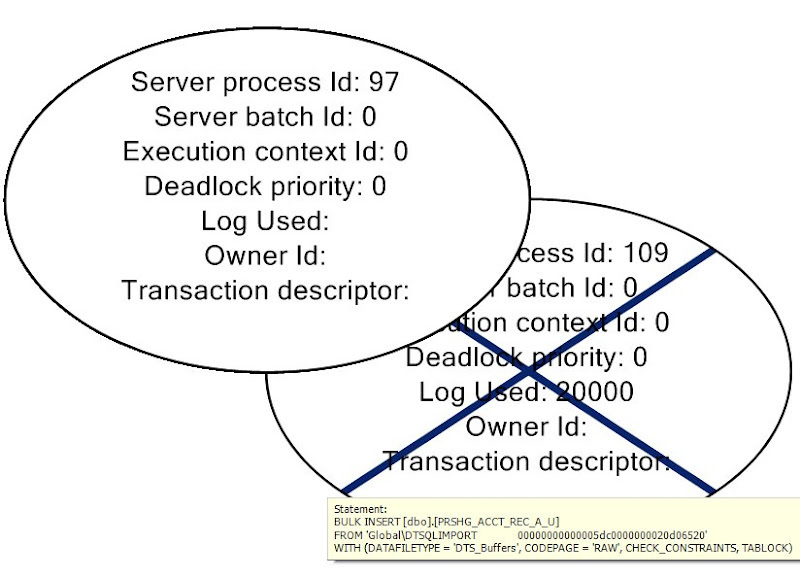 A minor change suddenly causes "Transaction (Process ID N) was deadlocked on generic waitable object resources with another process and has been chosen as the deadlock victim" to rear its head. The only thing running at that time is the package itself, two unrelated tables so there shouldn't be contention on the resource but there was. My DBAs are busy so I start looking. My initial results indicated I'd have entries in my SQL Server log but no such luck. The first good clue of where to go was a post by tkizer on SQLTeam. She suggested turning on the trace flag 1222 and keeping an eye on the server log until the deadlock was encountered. That's easy enough as we could reproduce on demand. And new thing #1, I get to set a trace flag. Co-worker reran the SSIS package and voila, I have data. The problem to the novice is that there is now plenty of information in the server log but it didn't mean a thing to me. I suspect it's an acquired art, much like reading text query plans. The next thing I saw references to was that deadlock graphs could also help and that new thing #2 for me. I had used Profiler before to capture SQL statements but deadlock graphs sounded intriguing and dumbed down enough for a caveman-developer to understand. I fired up Profiler and started going through my available trace templates. Nothing there for a Deadlock type, nothing that even sounded promising but then I scrolled up and saw Blank. With Profiler running, my friend kicked off the package again and just like the first time I saw SSMS display geography results, I got all excited to see the deadlock graph show me what was killed plus the victor. That's what I couldn't decipher from the original text in the SQL Server log. Ok, so armed with the knowledge that an insert into table F deadlocked the insert into table A, I started asking the twitterverse. Much love to all for their thoughts on the matter. Buck Woody @buckwoody, asked about indexes first and then suggested I turn on the trace flag to look for references/triggers. *internet fist bump for having already captured that data* He indicated the spid and ecid would give me the transaction that blocked. I had different spids but the same ecid. I left it at I need to get "the text of spid 97 and 109 to find out why" there was a deadlock. I think I have those statements captured, they're BULK INSERTs but I was going to go exploring DMVs ^H^H^H^H DMOs to see how I could find that text. It feels like something I should have picked up at Grant Fritchey's SQL PASS 2009 session but that's been many moons ago. At this point, I get the bright idea to modify the trace to also capture sql batch statements so I know that I have the text that went along with the SPIDs. I run the package as coworker had left for the day and it worked just fine, no deadlocks. No clue what or why it worked but I'll have him rerun tomorrow to see if it's magically cleared up. Otherwise, I'll have my DBA with me to go over the database log and the nifty xdl I captured. 2011-02-09 15:42:37.00 spid62      SQL Trace ID 2 was started by login "angband\BFellows". 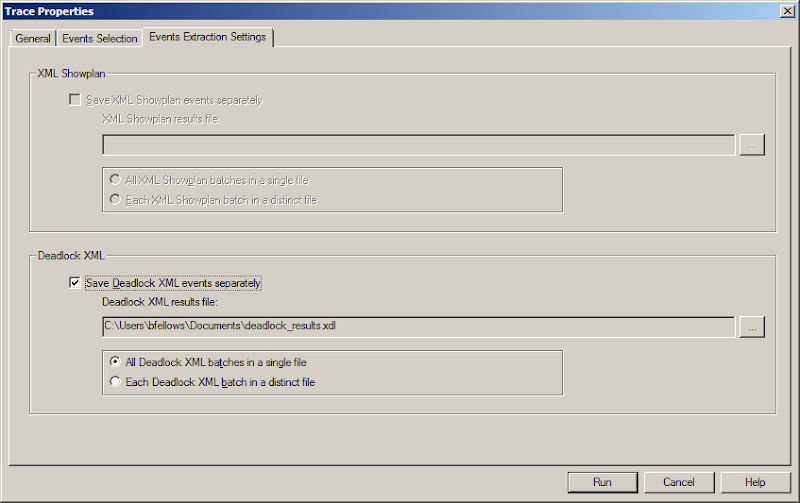 Finally, I have a link to the xdl generated by Profiler if you want to explore it from the comfortable confines of SSMS. I found your very helpful web page because I am a data architect about to do exactly what you are doing - extracting the Pershing Standard Files into SQL Server. I was interested to see your comment about the files changing every quarter - it's something I noticed also when reading all the documentation. Due to Change Management requirements it's not feasible to be changing an SSIS package every few months, so we are contemplating a meta-data table, well, two actually. One to hold the subset of standard files we want to transform, and another to map the data points we require with their matching file and ordinal position. if we treat each row in the second metatable as slowly changing data with a start and end date we can enter new file changes in advance with the correct start date. 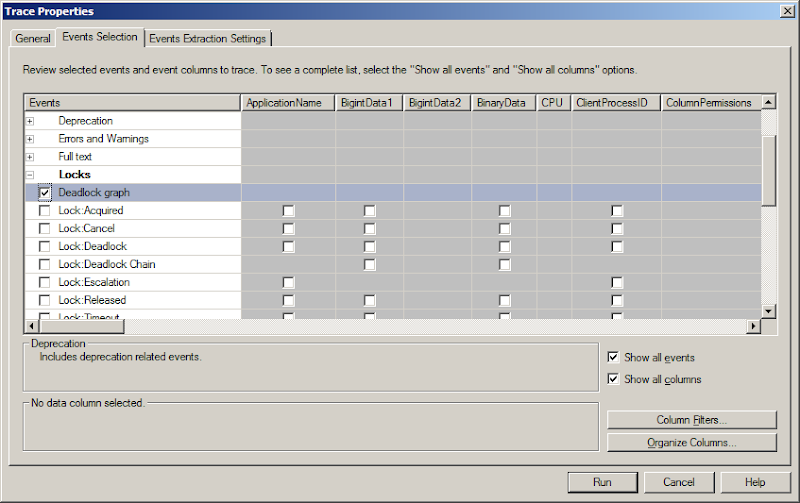 So monitoring the quarterly newsletters and keeping meta-data tables up to date will hopefully mean we can have an SSIS package that doesn't have to change over time. Interested to see your SQL table structure - exactly what I had in mind. If you have any other advice/tips/traps for young players that you can share I'd be very appreciative. And thanks for your great blog post. I was hoping you can help me. I'm the Compliance, Financial, IT (Yeah right)... everything for a small financial services firm. We use Pershing, Quickbooks and your standard MS Office Package for everything. I was put in charge of translating these things into a usable format. I have an accounting degree and would consider myself an intermediate to advanced user in Excel (very basic VBA); hardly a data technician or computer guru. Before I go into everything I've tried, can you tell me, is it possible to create a template to translate these files in Excel or Access? Any help you could give me would be GREATLY appreciated. I've been passively working on this since 2013 and everything leads to a dead end!